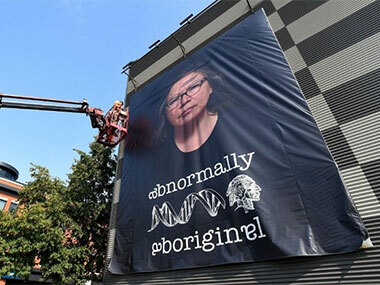 An art installation entitled, "Abnormally Aboriginal" by Six Nations photographer Shelley Niro. She's noted for work that challenges stereotypes of Indigenous women. I first seriously became aware of Canada's Aboriginal people in 2010 when my daily Google feed of online mentions for “Aboriginal art” started to trend towards almost 50% Canadian content. It was the Vancouver Winter Olympics which had pressured that trend with British Colombia's tribes demanding their place in the snow. This week, the Sydney Festival UTS Big Thinking Forum tackled the subject of 'Competing Sovereignties', which made it clear that tokenistic repetitions of a formulaic 'Welcome to Country' weren't going to be enough to satisfy our more political Indigenes such as RMIT University's Prof Mark McMillan, who declared that “Our 70,000 years of experience of sovereignty, of borders and of responsibility to our places” should make non-Indigenous people think twice about their puny 240 years' experience. Or UTS Prof Michael McDaniel's claim that post-1972 (what happened then?) “Every practice of my culture is a political statement; every artwork by an Aboriginal artist is political – a deed to Country”. Much of the Forum will be broadcast in 'Speaking Out' on ABC Radio National at 8pm on Australia/Invasion Day, and at 9pm Sunday 28th January on ABC Local Radio then on the ABC Listen App. But much that was said in it referenced a recent article I'd read in the Hamilton Spectator – the news organs for a city on the western end of Lake Ontario, close to Niagara Falls. Journalist Jon Wells reveals how recently Canadian Indigenous 'Welcomes to Country' have been implemented, but also how much deeper is the relationship with non-Indigenous Canada via treaties and a Truth & Reconciliation Commission – neither of which came up as issues in the Sydney Forum. Here is that article. It was the spring of 2016 when perhaps the first local public declaration was made. It was this: what most Hamiltonians think of as their home, is in one sense, not. It was McMaster University convocation, at Hamilton Place, named after founding father George Hamilton — he of Scottish blood and Queenston Heights birthplace — and the ceremony began with a man carrying a silver mace, the symbol of the authority of the Queen. The incongruity of the colonial-themed setting was not lost on cerebral McMaster president Patrick Deane, who announced: "I will end where at future convocations I intend us to start, by recognizing and acknowledging that we meet on the traditional territories of the Mississauga and Haudenosaunee nations, and within the lands protected by the Dish With One Spoon wampum agreement." Similarly-worded territorial acknowledgements now open Hamilton City Council meetings and community events ranging from a YMCA peace medal breakfast to a celebration of the Baha'i faith. Since September it has been the prelude to the school day for many Hamilton students during morning announcements — a "best practice" urged by the public school board, although not yet the Catholic board which has confined the acknowledgement to board meetings. Does the ubiquity of these acknowledgements, along with developments in education, art and culture, suggest we are in the midst of a powerful Indigenous moment of reconciliation, and reckoning; history clearing its throat when considering the long and often painful relationship between two peoples? Or is it all much less than meets the eye? The jaded second view was how Rick Monture reacted in 2014 when the Six Nations (Reservation) resident and Indigenous Studies professor at McMaster University was asked to help craft a territorial acknowledgement for the school. "I quietly sort of didn't answer back," he says. "I didn't want it to be a hollow thing that gives people the sense that all is forgiven, and I told them as much." He knew they weren't looking for him to offer wording that suggested land be given back, moreover the history is complex. "How far back do you go? You can't capture who lived here in a sentence or two." His position was borne out recently, when historical references in the City of Hamilton's statement were debated in the Spectator with Chief Stacey LaForme of the Mississaugas of the New Credit, and Chief Ava Hill of Six Nations, offering competing views over who should be acknowledged as "the treaty peoples of these lands." offering public territorial acknowledgements was not, as is commonly assumed, one of the 94 "Calls to Action" issued in 2015 after eight-years and $72-million work from the Truth and Reconciliation Commission. That same year the Canadian Association of University Teachers created an Indigenous peoples working group and developed a guide for land acknowledgement statements tailored to every university in the country: from the Beothuk and Mi'kmaq peoples in Newfoundland to the "unceded traditional territory" of the Snuneymuxw First Nation on Vancouver Island. The Edmonton Oilers and Winnipeg Jets of the National Hockey League got in on the campaign: at the start of the 2016 season they began offering acknowledgements in their arenas before the national anthem. From an Indigenous perspective, the concept of territorial acknowledgement is one that has always been practiced among First Nations peoples. It happened at ceremonies, or when one tribal member would light a small fire on the outskirts of territory he was visiting, wait for someone to meet him, smoke a peace pipe, acknowledge whose land it was, discuss intentions. "It's an Indigenous protocol, we've always done that," says Shylo Elmayan, who directs the City of Hamilton's urban Indigenous strategy. "But now everyone is noticing it because non-indigenous organizations are saying it." Prof. Monture eventually came around and helped draft McMaster's statement. Still, he alternately conveys hope and despair, is not all-in. "I wouldn't call them an empty gesture, but there is no teeth. Politicians and university presidents can give the statement, and it raises awareness in the listener a bit but doesn't mention how the land was taken way. It's just, 'this is the land of people who lived here,' and they stop … But I understand the value of the gesture toward real change." For her part, Six Nations band council Chief Ava Hill believes acknowledgements are one sign of a powerful moment of reconciliation we are now experiencing, and that credit belongs to survivors of residential schools who came forward to tell their stories to the Truth and Reconciliation Commission. "It's because of them these issues are at the forefront, not only in Hamilton, but elsewhere. Hopefully, it will continue, and I think it will … I've been telling people in my speeches: what can you do, what part can you play in this reconciliation?" At the recent Our Future Hamilton summit at LIUNA Station, Hamilton Mayor Fred Eisenberger opened with the statement, but more noteworthy was Indigenous content that followed. First there was native music and dance, followed by Shylo Elmayan from the city (wearing moccasins for "rock your moccasins week"), who spoke on electoral reform to better involve native peoples through online voting. Elmayan has experience acting as a bridge between two peoples: she has worked as a tenants' rights advocate for Indigenous people, and for Hydro One as a liaison between the company and natives. But she holds no illusions about the size of her task with the city, helping raise awareness of Indigenous history and culture and advance the cause of reconciliation. The Indigenous way, she says, is to forever be aware of the seven generations who came before, and the seven generations to come. She hopes to develop a policy on Indigenous medicines, which was the focus recently at the first national Indigenous Health Practice and Research Conference in Hamilton. For example, she'd like to see such things as a smudging ceremony accommodated in city facilities (burning medicinal plants to make a smudge, or cleansing smoke). Elmayan, an Anishinaabe native, is a reminder that, when it comes to heritage, there are few straight lines. She grew up in Hamilton; her mother is Indigenous from the Long Lake first nation up north; her father, whose surname is Summers, is non-indigenous from Hamilton's North End. But her Indigenous heritage, she says, is fundamental. "Canadian' is complicated. Many Indigenous people do not identify as Canadian. On my father's side, I'm Canadian, it's important to honour him, too." Perhaps the most fertile ground for influencing hearts and minds toward reconciliation is education — which was a point emphasized by the Truth and Reconciliation Commission. President Deane is proud to point to steps taken at McMaster: the school has unveiled new buildings and facilities for Indigenous learning including an outdoor classroom overlooking Cootes Paradise and created the McMaster Indigenous Research Institute. Last spring the university appointed a curator of Indigenous art for the McMaster Museum of Art; in the summer it was a hub site for the North American Indigenous Games and flew the flag of the Six Nations Confederacy on National Aboriginal Day. And yet some call on universities to go much further than that to "indigenize the academy," which means infusing all aspects of post-secondary education with Indigenous content, including mandatory courses in Indigenous study for undergraduates. Some universities have taken this step already, such as the University of Winnipeg and Lakehead University in Thunder Bay. Deane said the concept has been discussed at McMaster, but the consensus among educators and students is that compulsory learning is not the way to go. He has support on that position from Rebecca Jamieson, president of Six Nations Polytechnic (SNP), an institution with a campus on the Reserve that offers a university degree in Indigenous language, and hosted an Indigenous Research Symposium last month. "You can't indigenize something that isn't Indigenous," says Jamieson, who lives on Six Nations, the most populous Indigenous reservation in Canada. Better, she says, to develop in the academy the spirit of the two-row wampum — a belt that symbolizes two separate peoples coexisting through mutual respect and understanding. Tom Deer, who teaches the Mohawk and Cayuga language at the school, and is one of the "guardians" of knowledge, says the goal shouldn't be making other institutions Indigenous, but to enrich learning at places like SNP and then share with others. He believes territorial acknowledgements are positive; anything to "put that presence out there, whereas before we were pretty much invisible and forgotten, marginalized." But he fears they will become rote: words that once surprised or shocked audiences are no longer truly heard. He thinks that Canadians, and especially new immigrants, need to be taught about the 12,000-year presence of Indigenous peoples. Debicki, an Indigenous woman and PhD graduate, received a standing ovation for a valedictory speech that focused on reconciliation even as she did not shy away from calling what happened to her people in the past "genocide." Debicki's mother was Indigenous and gave her up for adoption at birth. She was raised by non-indigenous parents who encouraged her to embrace her native roots. She says reconciliation work has been going on for decades but believes what's happening now could be transformative. Deane says he's sympathetic to those who feel what is going on at Mac and elsewhere falls short of fundamental change. "But at the same time, I think it feels as though we are in a different place. The Truth and Reconciliation report was a massive intervention into Canadian social history and politics; there is no ignoring it, there is no going back to a pre-TRC world … I see this as a rapidly accelerating and deepening shift in the country." There are places in Hamilton where you can tangibly feel that shift, symbolic though it may seem. Edited, illustrated and re-published with the permission of Jon Wells and the Hamilton Spectator. 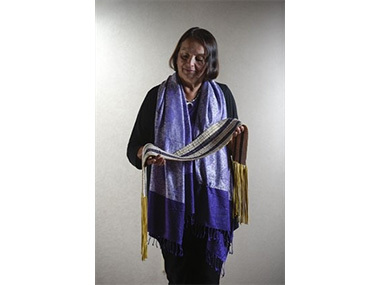 Rebecca Jamieson, President of the Six Nations Polytechnic holds a two row wampum, the symbol of two peoples living separately but harmoniously. At McMaster Uni. 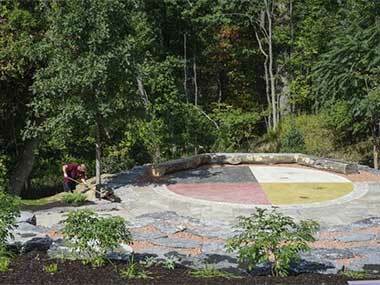 they've created an outdoor meeting place overlooking Cootes Paradise, through which wanders a new Indigenous Anishinaabe Waadiziwin Trail Experience.